This convenience kit includes both the Marrow Cellution™ BMA needle for acquisition of bone marrow aspirate and an 8 gauge bone marrow biopsy needle used for percutaneous trephine extraction of autogenous bone marrow/cancellous bone dowels. Intact Bone Cores vs. Morselized Bone. 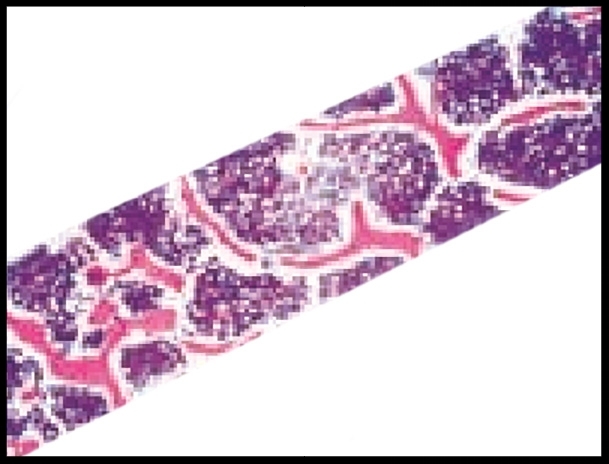 Under microscopic examination, the cancellous bone dowel’s micro-vascular network can be seen. Sub-chondral Bone Augmentation: Osteo-Core-Plasty: A concept that provides both Biologic and Structural components for an optimized environment for regeneration. Click Here To Learn About the patented Marrow Cellution™ BMA System. https://www.cochranelibrary.com/cdsr/doi/10.1002/14651858.CD011783/full accessed on 13 Nov 2018. Missiuna PC, Gandhi HS, Farrokhyar F, Harnett BE, Dore EM, Roberts B. Anatomically safe and minimally invasive transcrestal technique for procurement of autogenous cancellous bone graft from the mid-iliac crest. Can J Surg. 2011;54(5):327-32. Block JE. The role and effectiveness of bone marrow in osseous regeneration. Med Hypotheses. 2005;65(4):740-7. Wang W, Yeung K. Bone grafts and biomaterials substitutes for bone defect repair. A review. Bioactive Materials. 2017;2(4):224-227. Bleuming SA, He XC, Kodach LL, Hardwick JC, Koopman FA, Ten Kate FJ, van Deventer SJ, Hommes DW, Peppelenbosch MP, Offerhaus GJ, Li L, van den Brink GR (Sep 2007). "Bone morphogenetic protein signaling suppresses tumorigenesis at gastric epithelial transition zones in mice". Cancer Research. 67 (17): 8149–55.